Eight new officers were elected to the Union of Students in Ireland (USI) board last week at the annual USI Congress, who will spearhead policy and campaigns relating to students on a national level in the coming year. The Congress took place in Ennis over the course of four days and saw delegates from every USI-affiliated Students’ Union in Ireland come together to share and debate ideas. Michael Kerrigan, a GMIT graduate and the outgoing VP for the Border, Midlands and Western region, was elected uncontested as the incoming USI President with resounding support from the voting delegates. He will succeed Annie Hoey in the role. Speaking to The College View, Kerrigan stated that the independence of individual Students’ Unions was at the centre of his plans for the year ahead. “Working on the autonomy of our Students’ Unions has to be a priority because without autonomous Students Unions, we can’t do any work,” he said. Delegates voted to pass an amendment to the current USI constitution, which pledged to defend the autonomy of SUs and retain independence from all external authorities. Outgoing President Annie Hoey affirmed the Union’s commitment to this aim, saying that the ability to self-govern through a democratic process is at the heart of the student movement. “The reason they (institutions) don’t want us to have strong Students’ Unions or a strong student movement is because they know when we work together, when we organise together, we are an incredibly powerful group of people,” she said. Also elected at Congress were the positions for VP Campaigns, VP Welfare, VP Academic Affairs, VP Equality and Citizenship, VP BMW, VP Southern Region and VP Irish Language. 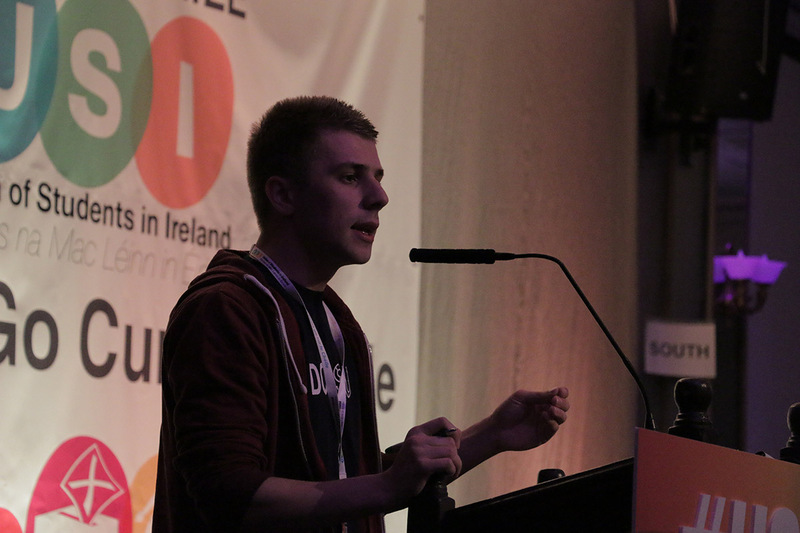 DCU student, Sean Cassidy, ran for the role of VP Campaigns, but lost out to Amy Kelly, the current President of GMIT SU. Three cornerstones that made up the agenda for the Congress were the election of these roles, the debate of motions and the amendment of the current USI constitution. Current DCU Postgraduate Officer, Allan Stevenson, proposed a constitutional amendment that would see the creation of a VP for Postgraduate Affairs on the USI officer board. While most voting delegates were in support of the creation of such a position, many argued that the USI did not have the funding to add an additional full time position this year. This came after a vote to create a VP position to solely represent students in the Dublin region, as well as the decision to pay the incoming VP Irish Language, a position which was formerly voluntary. Both incoming and outgoing USI Presidents pledged to revisit the issue at next year’s National Congress. Students’ Unions could put forward motions in areas they felt needed to be addressed, which were then debated and either passed or defeated. Motions were discussed in the areas of Welfare, Academic Affairs, Union Organisation, National Affairs and Gaeilge. In the area of Welfare, Congress voted to lobby the Government to reduce the age at which a woman can get a free smear test from 25 to 21, to aid in the early detection of cervical cancer. Outgoing Humanities and Social Sciences faculty rep, Caoimhe Ní Mhaolagáin, spoke on the issue and urged Congress to pass the motion. It was subsequently passed.